Senator Babafemi Ojudu, the Presidential Aide on Political Matters, said the recent NEMA probe report may have been outlined at a meeting of opposition leaders in a foreign country recently. Presidential candidate of the People’s Democratic Party (PDP), Atiku Abubakar, was in Dubai and returned to the country last week. 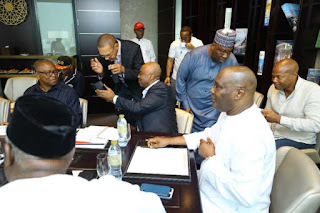 During this stay, Atiku held meetings with his running mate, Peter Obi, Senate President, Bukola Saraki, Senator Ben Bruce, among others. Others were members of his campaign team, top party chieftains and consultants. Reacting, Ojudu said: “We have read reports in the media that the meeting in a foreign country of the major opposition party was centered on trying to attack the Buhari administration by targeting the Vice President using different tactics. “It is now evident through the NEMA report, that the opposition is indeed making frantic efforts tarnish the image of the Vice President”. Ojudu said contrary to insinuations in some quarters, there were no violations in approval of N5.8b Emergency Food Intervention Fund for North-East and the then Acting President did no wrong in approving fund for the emergency intervention. He insisted that the presidential approvals were well within the clear constitutional authority of the then Acting President. “First of all, the action was in response to the threat of hunger and starvation based on strong warning received from the United Nation World Food Programme in April, 2017. “The organization had issued a warning that it would be reducing its vital support to about 1.8 million IDPs by as much as 85%, due to the corresponding reduction in funding by the donor countries. “Around the same time, the United Nations Commission for Refugees in Geneva also warned of the growing risk of mass deaths from starvation among people living in the conflict areas. “We know what is happening, but the administration will not be distracted. Our goals and objectives to put Nigeria on the solid path of greatness is now unstoppable and Prof. Osinbajo will not relent in that effort,” the presidential aide concluded.